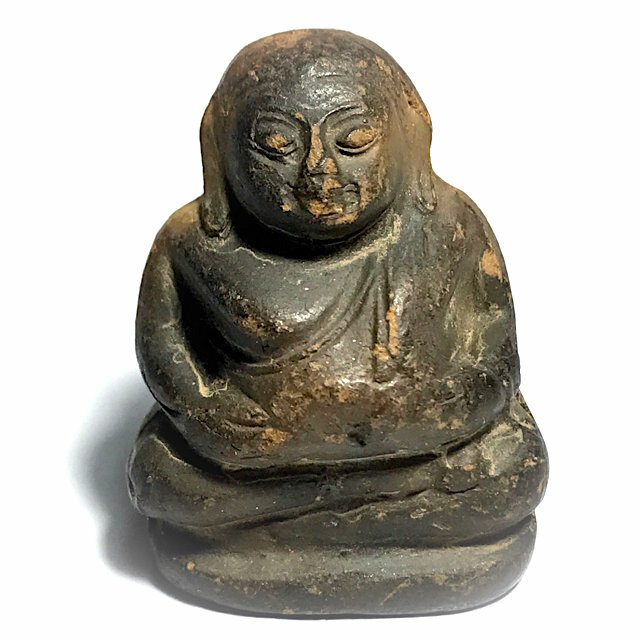 A very rare amulet of the great Luang Por Guay of Wat Kositaram, which was Blessed at Wat Nong Iduk with Luang Por Ruesi Ling Dam, and released around 2515 BE. The amulet is made from Nuea Din Pong Wan Pasom Bailan, with Kring Bead rattle inserted within. The Pra Sangkajjai was one of a large number of amulets made by Luang Por Guay, for Wat Nong Iduk, made from Sacred herbal powders, Earthen Clay with Black Bailan Parchment Soot. It is said that those who wish to only collect the standard accepted amulets of Luang Por Guay. The Pra Sangkajjai Nuea Din pasom Wan Bailan Dam is a very rare amulet, for Luang Por Guay did not make a large number of this series. There were two main kinds of Pra Sangkajjai released in this edition 1. Pra Sangkajjai Khang Met Lotus petal shaped image with dotted edges, and the Pra Sangkajjai Loi Ongk (in Pim Lek and Yai small and large sizes).